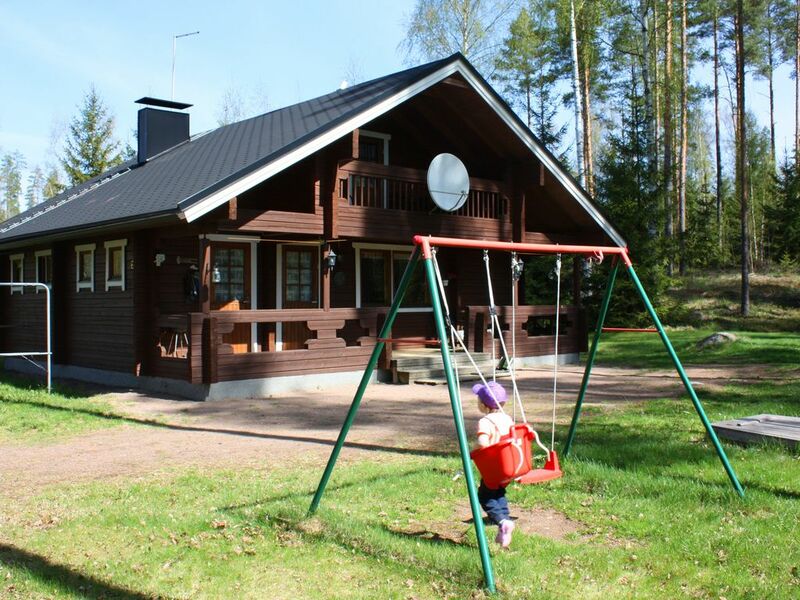 The cottage is located on the shore of Lake Iso-Ruhmas (to the beach 100 m). Own plot of 4 hectares, the length of the coastline 100m. The cottage has 3 separate bedrooms on the first floor -two (two beds), one on the second floor (three beds). In the hall on the second floor of a sofa bed, a single bed, an extra refrigerator. Additionally there are cot and mattress. There is a cot and highchair. Maximum capacity - 8 people (two for an additional fee). Living room with sofas, fireplace, TV, CD, Wi-Fi. Fully equipped appartment: large dining table, fridge-freezer, microwave, dishwasher, coffee maker, toaster, dishes for 12 people and other kitchen utensils, electric stove, wood stove. On the ground floor toilet, wood-fired sauna, shower, washing machine. The cottage has hot and cold water, electric heating (+ wood-burning fireplace and stove). There is a vacuum cleaner, ironing board and iron. Outdoor - garden furniture, grill, badminton, darts, swing, sandpit. At the lake its own beach, the beach is sandy, gently sloping. There is a boat with oars. Good fishing - bream, perch, whitefish, pike-perch, trout, pike. In winter 800m from the cottage lighted ski trail. Summer - picking mushrooms, berries, fishing, boating. Possible transfer and additional services.